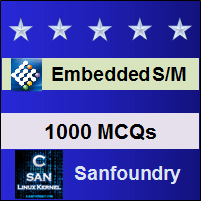 This set of Embedded Systems Multiple Choice Questions & Answers (MCQs) focuses on “Architecture of Embedded System”. 1. Which one of the following is the successor of 8086 and 8088 processor? Explanation: 80286 is the successor of 8086 and 8088 because it possess a CPU based on 8086 and 8088. 8051 is a microcontroller designed by Intel which is commonly known as Intel MCS-51. 8087 is the first floating point coprocessor of 8086. 2. Which is the processor behind the IBM PC AT? Explanation: The processor was successful in the PC market and it was a successful processor behind the IBM. 3. Which are the two modes of 80286? Explanation: It possess two modes which are called real and protected modes. In real modes it adds some additional register in order to access a size greater than 16MB but still preserving its compatibility with 8086 and 8088. 4. Which register set of 80286 form the same register set of 8086 processor? Explanation: The 16 bit register of 80286 can also act as 8 bit register by splitting into a higher register and lower register. 5. Which are the 4 general purposes 16 bit register in Intel 80286? Explanation: Intel 80286 possess 4 general purpose registers and these are 16-bit in size. In addition to the general purpose register, there are four segmented registers, two index registers and a base pointer register. 6. Which are the 4 segmented registers in intel 80286? Explanation: Intel 80286 possess 4 general purpose registers, 4 segmented registers, 2 index register and a base pointer register. 7. How is expanded memory accessed in 80286? Explanation: The 80286 processor can access beyond 1MB by paging and special hardware to stimulate the missing address lines. This is called expanded memory. 8. When is the register set gets expanded in 80286? Explanation: In protected mode, two additional register arises which is called index register and base pointer register which helps in expanding the register. 9. Which are the two register available in the protected mode of 80286? Explanation: In the protected mode of 80286, two additional register arises which is called index register and base pointer register. 10. What kind of support does 80286 access in protected mode? Explanation: In the protected mode of 80286, two additional register arises which is called index register and base pointer register. This allows the 80286 to support virtual memory scheme. 11. Which of the following processor possess memory management? Explanation: Because of the efficient paging mechanism, 80286 is one of the processors which allows the memory management unit. 8086 and 8088 does not allow paging mechanism. 8051 is a microcontroller which have an in-built memory and does not possess a paging mechanism. 12. What is the size of the address bus in 80286? Explanation: The size of the address bus in 80286 is 24 bits and 20 bits in 8088 and 8086. 13. Which is the interrupt vector in 80286 which functions for stack fault? Explanation: 12 is the interrupt vector indicating stack fault. It will be different for a different microprocessor. 14. Which is the interrupt vector that functions as invalid opcode? Explanation: 6 is the interrupt vector indicating invalid opcode. It will be different for a different microprocessor. 15. Which of the following possess the same set of instructions? Explanation: 80286 is based on the architecture of 8086. So both the processors have the same set of instructions with slight variations.